Traditional Czech seed beads are made in the Jablonec area and are the result of the glass makers craftsmanship and modern technology. Although most small industries produce for the Preciosa-Ornela company, there are still a few that have kept to themselves. Interesting enough it is the big conglomerate that keeps the cottage industry alive as we all seek that something special. 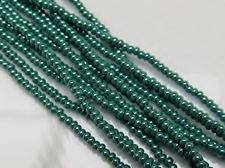 These popular Czech seed beads can be used in stringing, weaving, embroidery, crocheting and so on. Give it a go and see if you like dune beads' choices. always purchase a few more beads than you expect to need to avoid finding yourself a bead short.